WOW your guests with one of our magical Bridal Shower Candy Bar Favors. 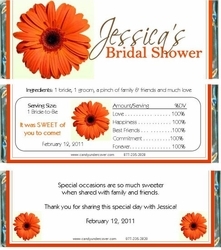 Our beautiful ORANGE GERBER DAISY design is a top seller. Perfect for Bridal Showers, Weddings and more. Chocolate is the SWEETEST favor and is sure to be a hit at your party!